Numerical weather prediction was not the only forecasting technique to face opposition in the 1950s. Meteorologists who advocated the use of statistics as a prediction tool also confronted significant opposition from their synoptic meteorology colleagues. The synopticians—those meteorologists who met the daily challenge of preparing weather forecasts— viewed statistical methods with virtually the same disdain with which they had viewed the dynamic meteorology of Vilhelm Bjerknes some 50 years before. Certainly dynamic meteorology had been critical for gaining a more detailed understanding of atmospheric processes, but did it help forecasters determine the next day's weather? For most synopticians, the answer was no. Similarly, early 20th-century attempts to use statistics in forecasting had not given forecasters much useful information. On the contrary, statistics had often just confused the issue. When statistical methods were divorced from dynamic considerations—for instance, when some statisticians attempted to connect the position of the planets with weather on Earth—they lost all credibility. By the 1950s advances in statistical theory and increasing computer capability made the use of statistics for weather forecasting seem more promising. The large amount of observational data streaming in every day gave atmospheric scientists an instant "snapshot" of the world's weather. This snapshot was what statisticians would refer to as a data sample. Although the data sample could be used to calculate atmospheric disturbances, some of them would be too small to be handled by numerical weather prediction—which "filtered out" such small-scale effects to keep the solution under control. These small perturbations did appear to be statistically distributed, as meteorologists could see by looking at precipitation charts. Some geographic areas consistently received more rain than others even when affected by the exact same weather system. Using statistics and making probability forecasts for precipitation (for example, 30 percent chance of rain) seemed to be the best choice. To succeed, meteorologists and statisticians had to work together since neither group was likely to have full knowledge of the other's field. Meteorologists could provide advice on which physical properties were dynamically related and statisticians could "crunch the numbers." 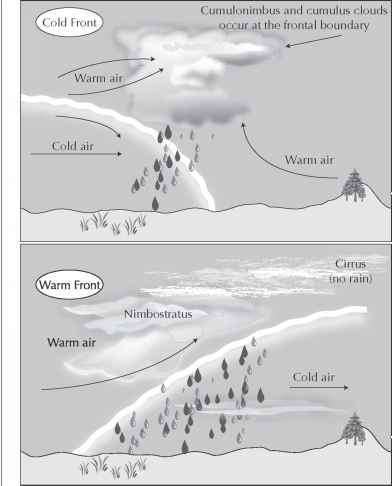 For example, there is a strong correlation between air mass type and air temperature. If the air mass changed (the front passed by) suddenly, then the statistical prediction would fall apart. Statistical techniques had to be used together with a subjective analysis of the atmospheric situation to be effective. As promising as it seemed, in the 1950s the use of statistics in meteorology was actually restricted to the use of statistics in climatology. Climatological studies began during World War II and continued after the war, allowing meteorologists to compute probabilities for temperature and precipitation in a given locality for a given week, month, or season. These climatological statistics offered the promise of clues to general atmospheric circulation and short-term forecasts. Improved data collection and analysis, as well as statistical techniques, gradually made statistical meteorology more acceptable. Increased computer capability allowed the inclusion of more atmospheric variables, which heightened the physical reliability of the result. Particularly in hurricane and tornado forecasting, statistical methods would become critical for determining where these severe weather systems were most likely to strike. What is the use of statistics in meleorlogy? How does meteorology relate to statistics? How statistics applied in meteorology? How is meterology related to statistics? How do meteorologists use statistics?